One of the great things about Vine and now Instagram, too, is the ability to stop filming and pick up right where you left off. It has the effect of producing more dynamic, interesting clips than you would otherwise. But that's the problem—your're stuck to clips. With Clipper, though, you can get that very same result without the time constraints. All your filming is done outside the app, but once you open Clipper, you can choose from all of the shots in your camera roll, splicing and switching as you see fit. Once you start a new project, you can change the order of your clips, trim them, and add or subtract. You can even crop vertically filmed videos (you should be ashamed of yourself) down to size so continuity doesn't get interrupted. For final touches, you can pick a song from your music library, add effects, and you're ready to share. 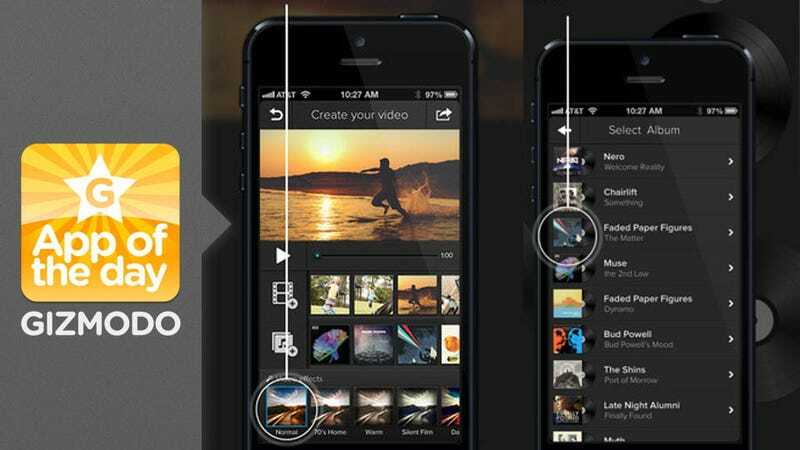 The native video editing features on your iPhone are sufficient, but you're not going to be making anything spectacular with the tools available to you. Here, you can create something that feels multi-dimensional and properly packaged. Plus, it beats having to transfer everything over to a desktop.